Every Christmas my grandparents used to set up a little village of vintage-style ceramic houses. They were lit up and arranged with fake snow and tiny trees. I loved it, and it still holds a special memory for me, but it wasn’t really for touching. Help your child create a Christmas village they can play with or have on display in their room. They’ll love having decorations that are all for them, holding onto the memory of making it with you! You can color the houses and trees with pencils or markers, or leave them plain white. You can also print them on colored paper! Personally, I love them in white, because they feel so modern. The PDF just below includes blank house and tree outlines so your child can design and draw their houses however they like. 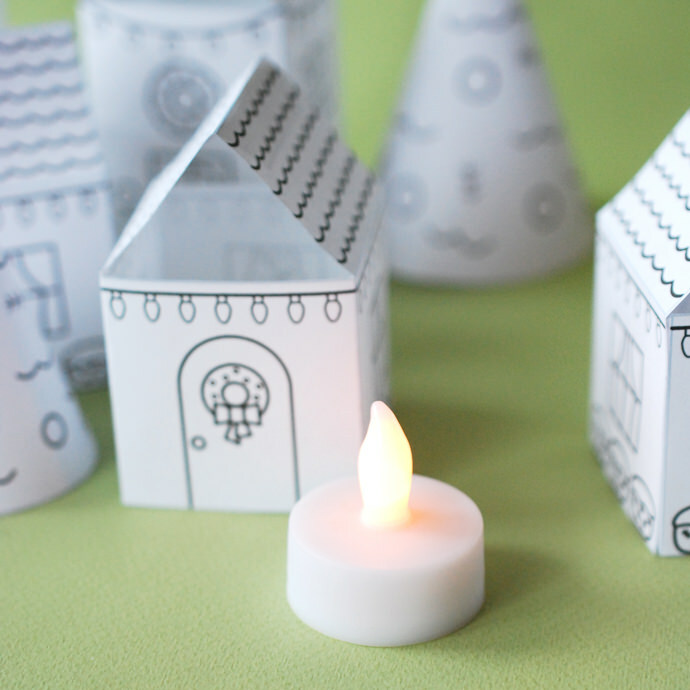 Then, if you want to add light, grab some battery-operated tea lights so your village can glow! 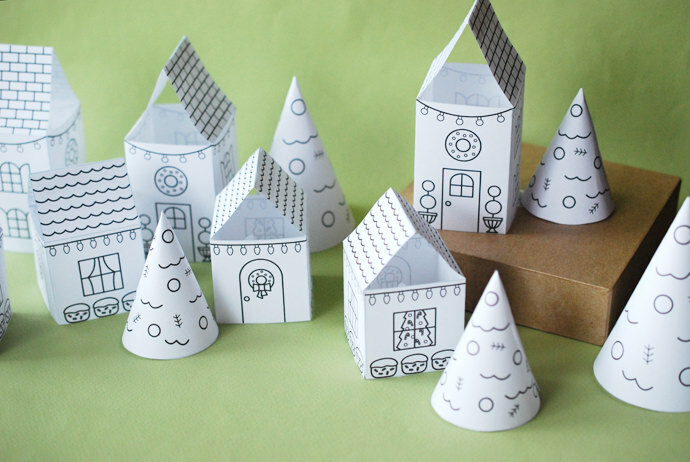 For a sturdy village, print as many pages as you want onto card stock. 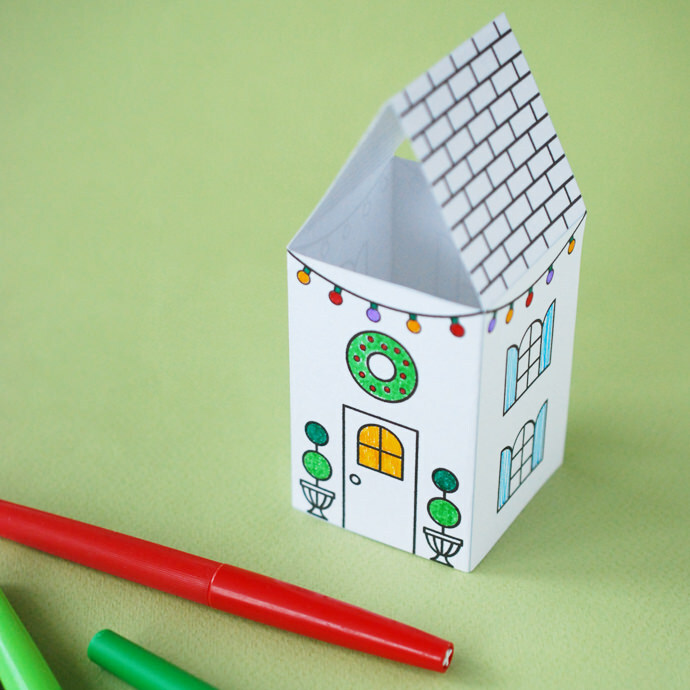 This is a good choice if you’ll be coloring with markers, but card stock houses and trees don’t glow as well. 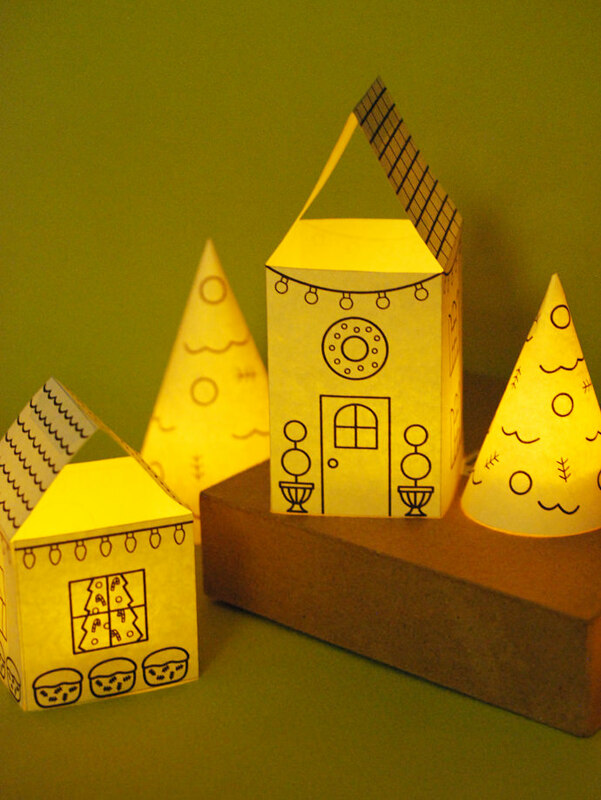 For a village that will light up, use regular paper. Colored pencils work great for this option. If you’re going to color your village, this is the time to do it. Color as many or as few details as desired, or leave the pieces uncolored. Cut around the shapes of the houses and trees. Fold the house shapes on the gray lines, including folding back the tabs. Don’t fold the tabs on the trees. Apply glue stick to the tabs. For the houses, it works best to glue the wall tab first, then glue the roof tab. For the trees, roll the tree into a cone shape and secure the tab. Start planning your winter display. Set out the houses and trees. You can rotate the houses to show the sides and give them a different look. Adding small boxes or blocks for stands is good for visual interest. 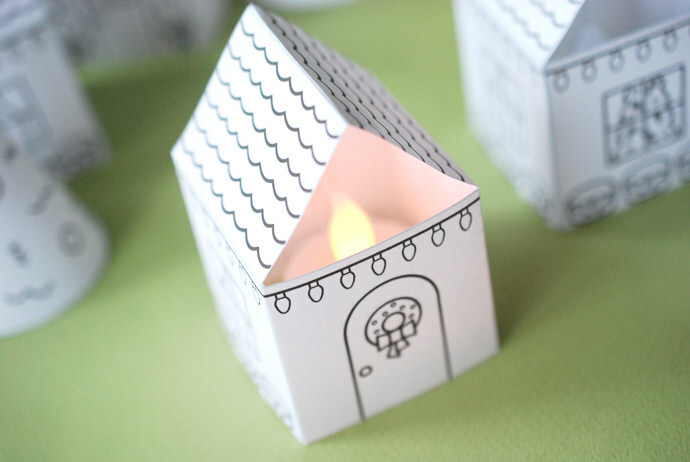 Place battery-operated tea lights inside your paper village to light up your display. Some companies even make this type of fake candles with timers so your village can glow at night, turning itself off and on again. Perfect for a bit of light as a child goes to sleep. Important: NEVER use candles with real flames in your printable village! Enjoy making this winter scene with your child, and then sit back and watch them enjoy their play-friendly decoration. 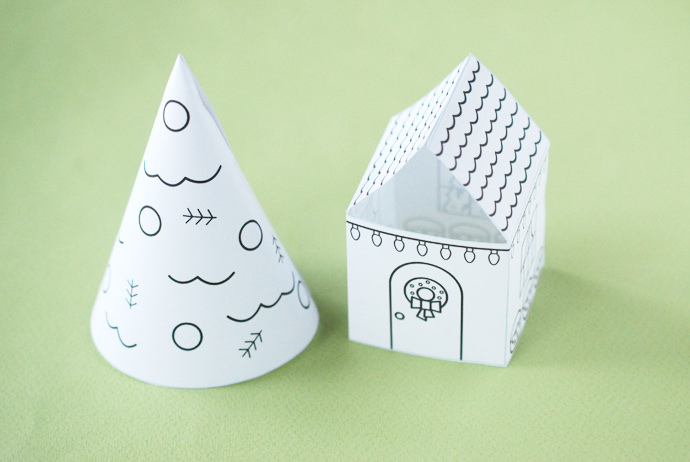 Or, for another option, print out 24 houses/trees and light up one each day as you count down to Christmas!